When kids learn the parts of a book, they learn that a book is made up of pages. If they turn more than one page at a time the story (or information presented in the book) doesn’t make sense! This is a great worksheet to use after spending time teaching kids about the parts of a book. 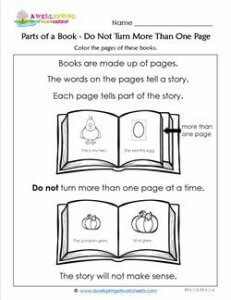 Take a few minutes to show them how we turn one page at a time and what happens when you turn too many pages at once.